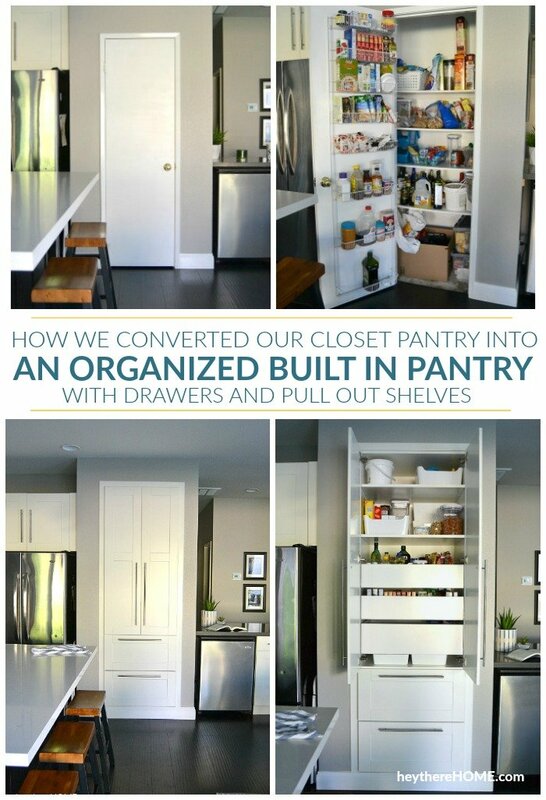 Inside: How we transformed our dysfunctional closet pantry into an organized kitchen pantry with pull out shelves and drawers. Eight years ago we completely remodeled our kitchen and made huge improvements, but the one thing we left undone was the closet pantry. We’d planned to get to it a lot sooner, but it’s one of those projects that we knew we’d have to figure out as we went, which can be intimidating. But what I want to show you is that everything is figure-out-able. Yes, we ran into a few snags along the way, but that’s often part of the process to getting the home you want and definitely worth your time. 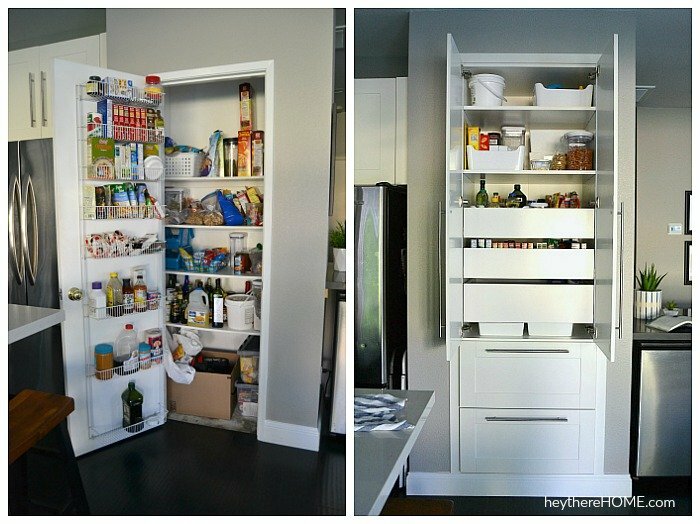 Our new pantry has improved our lives so much in the few short weeks it’s been done! 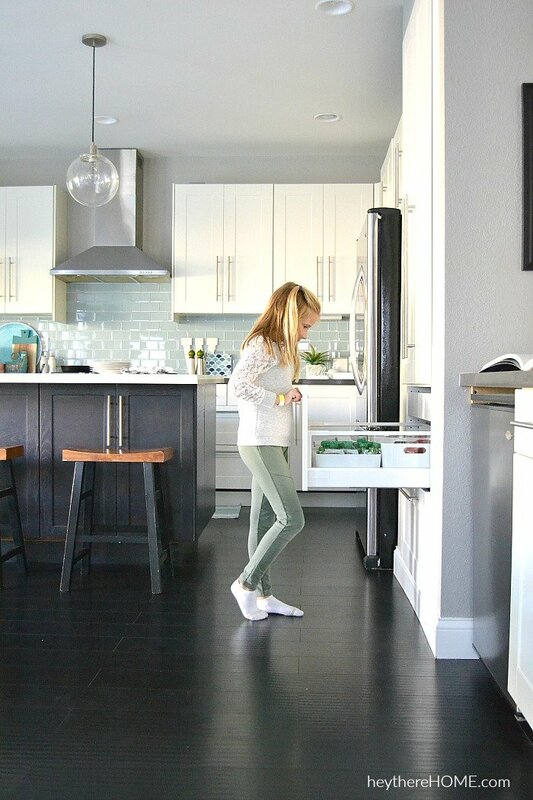 Not only is all our food in one place (we no longer have to store things in the closet under the stairs), but we designed the drawers at the bottom to be easily accessed by the kids, which is a game changer! **For a complete behind the scenes of this pantry remodel, click the pantry remodel highlight story on my Instagram feed here. 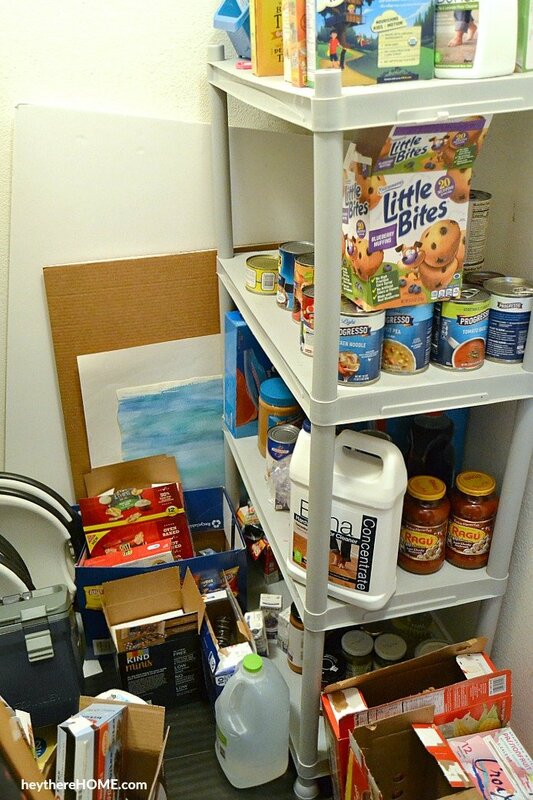 The problem with the closet pantry. The closet pantry that the builder put in didn’t function well. Sure, it had some shelves, but they were spaced poorly and didn’t even come out the full depth of the closet which left a lot of empty (wasted) space at the top of the closet. Our temporary fix was the door rack we installed to hold smaller pantry items, and bins to keep things organized. They helped but as you can see everything was still a bit of a mess. We also had to store bulk items and canned goods in the closet under the stairs which meant packing lunches in the morning or getting dinner ready often involved me having to walk out of the kitchen a few times… no good. 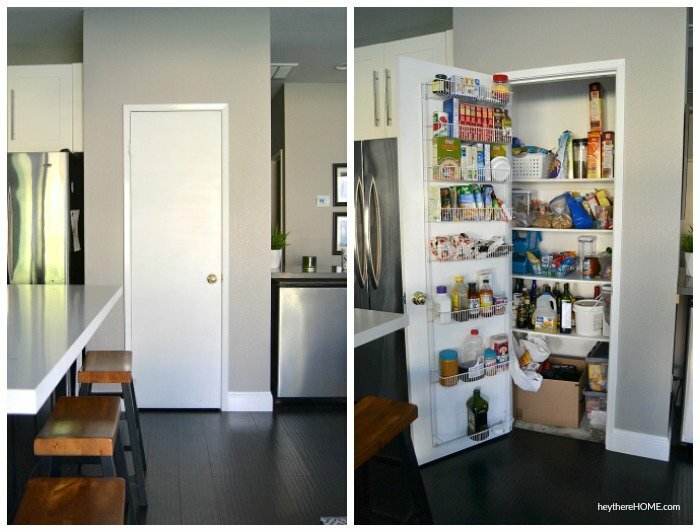 How we converted our closet pantry into a built in pantry with drawers and pull out shelves. Making space for the new cabinet. 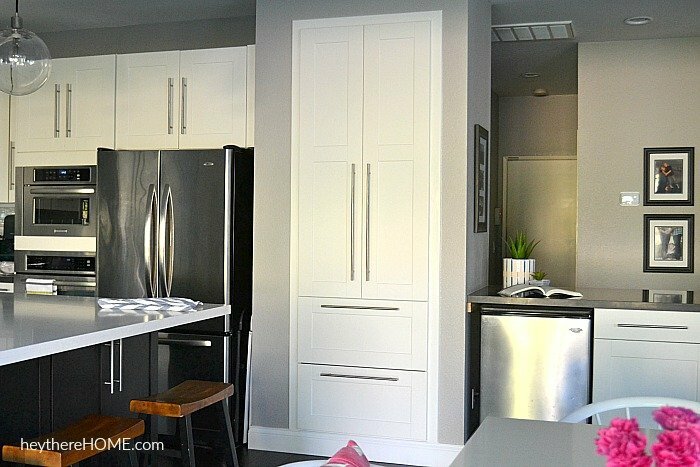 The plan was to create a space to slide in a 90 inch Ikea pantry cabinet to match the existing cabinetry in our kitchen. We started by demoing the existing shelves and trim. The measurements on the inside of the closet gave us 40 inches to work with, but the cabinet we used was only 30 inches, so we had plenty of room to spare. 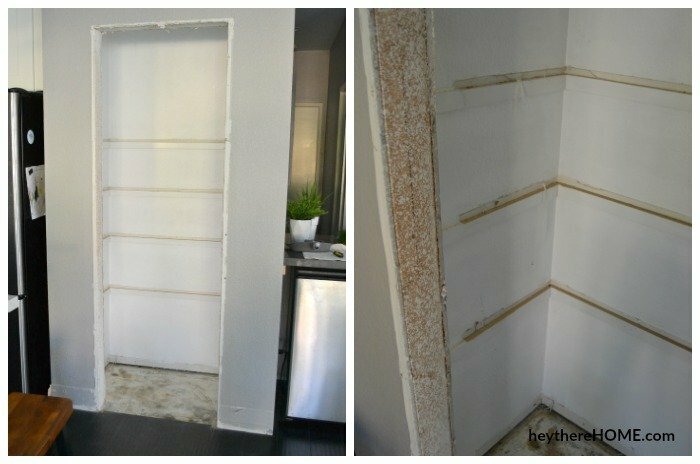 Once the demo was done, we measured out our cuts to allow for the cabinet to slide into place making sure our lines were plumb and level. 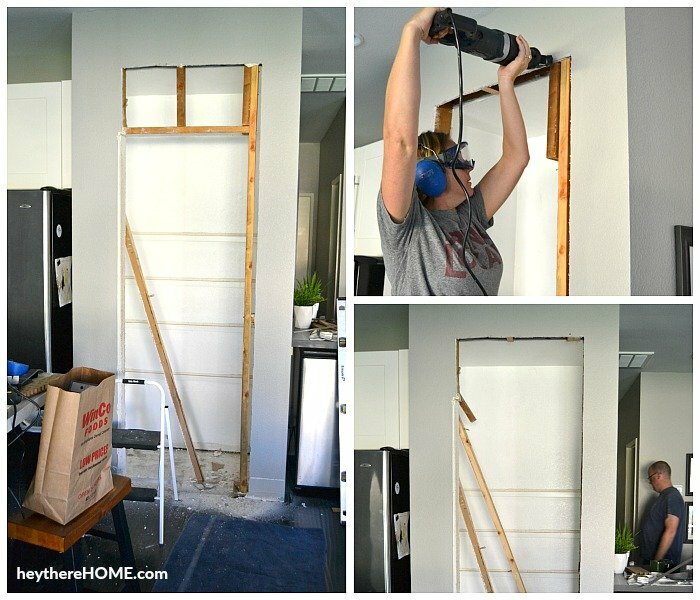 We started cutting from the inside of the closet first so we could see what we were dealing with behind the wall, then moved onto cutting and removing the drywall on the outside wall as well. I should also mention that we knew we’d have to remove the current door frame, and to make things easier and not have to re frame both sides of the door we decided to have our pantry slightly off center. It’s barely noticeable and also allows for the pantry doors to open without interference from the kitchen island that’s close by. 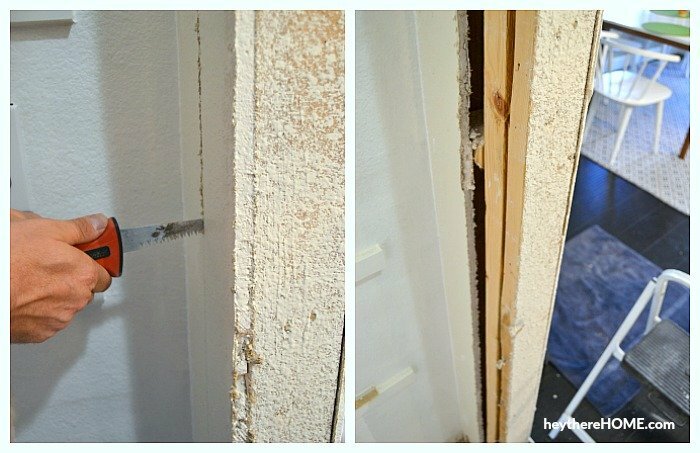 Once the drywall was removed we removed the door framing using a reciprocating saw. Using a new 2 x 4 we rebuilt the side of the door frame that we’d taken out to frame the new opening and to have a place to attach the new cabinet. Preparing the cabinet to be installed. 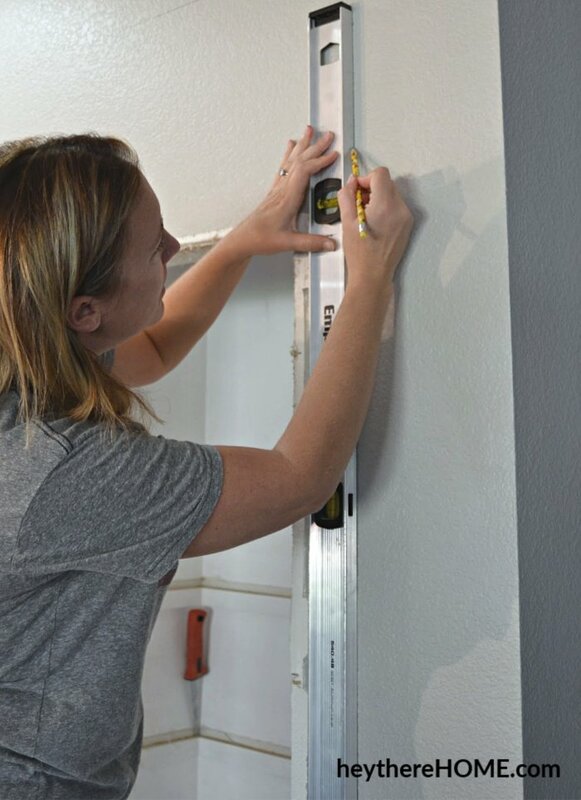 We wanted to be able to put our baseboard straight across the wall below the built-in pantry but since our baseboards are five inches tall, we needed a way to raise up the cabinet a bit more than the legs that came with the cabinet. And knowing that it was going to be a tight fit, we needed to be able to slide the cabinet into place, which the flimsy plastic legs would allow for. So we created our own sturdy base at the height we needed. First I built a simple box frame for the bottom using 5 x 2 pieces of wood and 2″ wood screws. 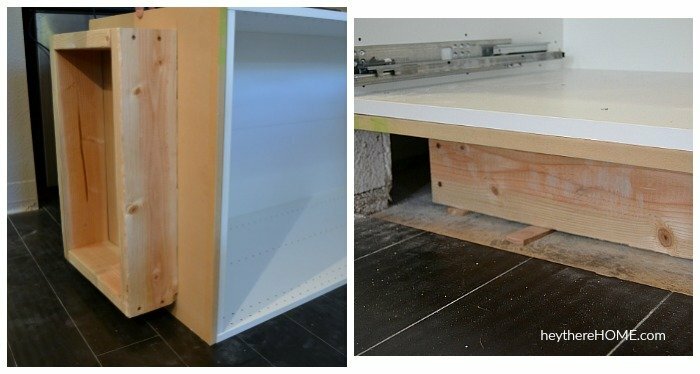 When we dry fitted the frame inside the opening we’d created with our baseboard we realized that we needed to raise the cabinet up another 3/4″ so that the bottom drawer wouldn’t scrape the top of the baseboard when it opened. 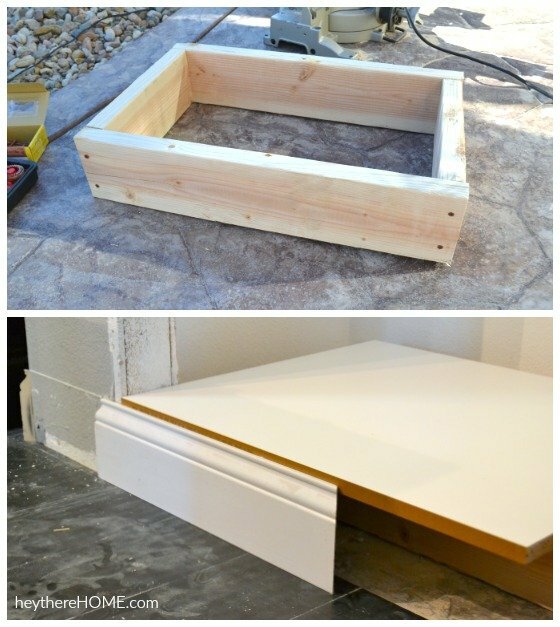 So we added a 3/4″ thick piece of MDF between the base and the cabinet and attached it from the inside bottom of the cabinet. **NOTE: The photo below shows the front of the base lined up with the front of the cabinet, which is not how it ended up. Remember I said everything is figure-out-able? Well, once we got the cabinet in place, we realized that we needed to pull the cabinet forward about 1/4″, instead of lining it up with the wall so that when you opened the drawers you wouldn’t see the gap. Pulling it out a little allowed for the trim piece at the end to hid the gap and make everything look super pro. Then we slid the cabinet in place and shimmed the bottom to get it perfectly level and plumb. I just mentioned that the first time we got the cabinet in place we realized that the placement was slightly off. We’d lined up the front of the cabinet with the existing wall, but realized that if it stayed like that, when you opened a drawer you would see a gap or the ugly cut drywall. So we had to pull the cabinet out, take off the base, push it back 1/4″, reattach the base, and slide the cabinet in again. 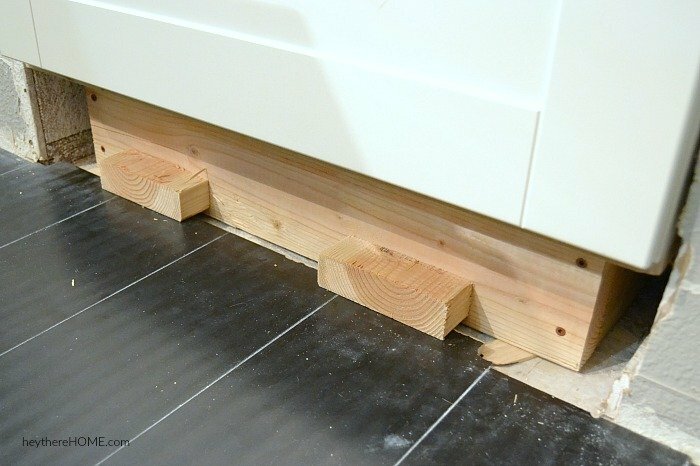 **Note: We wouldn’t have known this before it was too late had we not tested the drawers and dry fitted the baseboard and trim before securing the cabinet, so dry fitting everything at each step is really important. But once everything was dry fit and looked good (no more adjustments, thank goodness!) we secured the cabinet by attaching it to the 2 x 4 door frame with a screw from the inside of the cabinet. 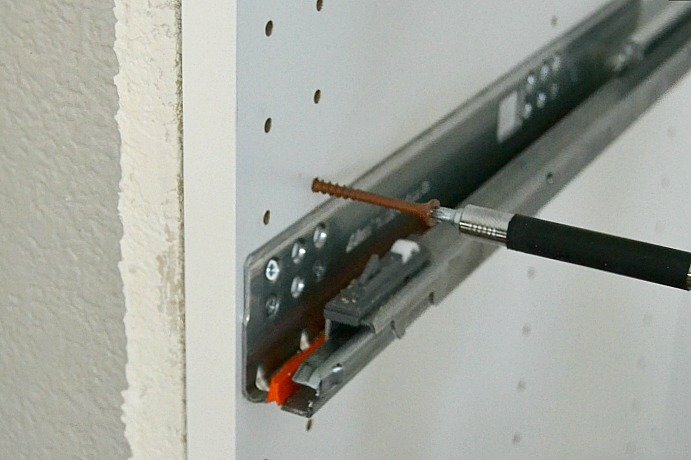 **Note: Make sure that if you’re installing hinges or drawer slides that you have them placed before securing your cabinet so you know which holes are okay to use. Since the wood floors in our house weren’t installed into the bottom of the old pantry closet, we couldn’t have the wood base we created come all the way to the front of our cabinet or the whole cabinet wouldn’t be level. Our fix was to have the base we created sit back from the edge. Then once the cabinet was installed, we built it out in order to have a place to attach the baseboard and have the baseboard go straight across the wall below the cabinet. Adding trim to the new built-in pantry cabinet. Once everything was in place and the doors were on, we added 2 1/4″ trim around the outside of the cabinet to give it a finished look. You can see below that the cabinet frame comes out just a tiny bit more than the thickness of the trim we used, which hides that ugly gap and cut drywall I mentioned earlier. 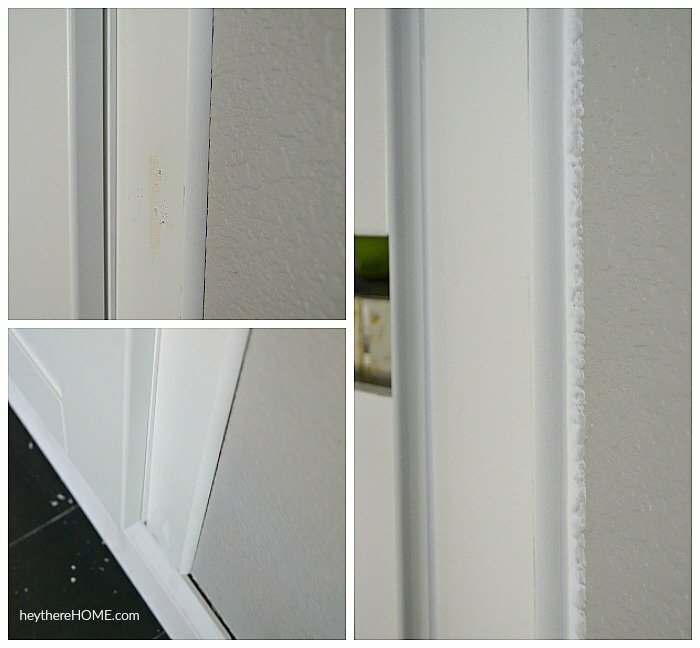 We attached the trim using finishing nails, patched them with spackle, and sanded them smooth. And to get the super finished look, I caulked all the seams before painting the trim with paint that I had color matched to match the cabinet color perfectly. Our new organized pantry with drawers and pull out shelves! I knew that this project would drastically improve the function of our kitchen, but what I didn’t expect is how beautiful it would make this space. The new cabinet takes up more visual space and looks so nice, whereas the old closet pantry door looked small and not to scale. And when you open the doors, it’s also nice to look at because everything is organized and has a place, which will help me stop buying things we don’t need! One of the things that was most important when I was designing our new pantry layout was organization and making sure that the kids would be able to easily access the things they need the most. The bottom drawers are perfect at this! We keep breakfast stuff and snacks in the bottom drawer, and grab-and-go lunch things in the top drawer. 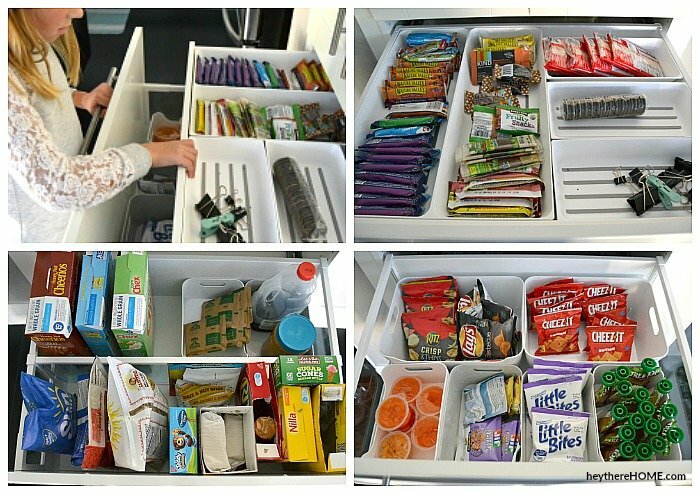 And inside the top drawer there’s a hidden drawer to keep smaller things like granola bars organized! The top portion of the pantry has three pull out shelves that hold our canned goods, rice, pasta, and jarred sauces, and oils, sauces, and some baking items. I do have to use a step stool to get something out of the back of the third pull out shelf, but I figured I would have to get a step stool out if it was a regular shelf as well. This way I can pull it out and quickly get what I need, rather than having to dig. On the top two shelves I store baking items in bins that can be taken out and set on the counter when I’m using those things, and bulk items like extra boxes of crackers, and nuts. And I have room to spare without having any food stored in the under the stairs closet! Everything in one spot feels soooooo good! 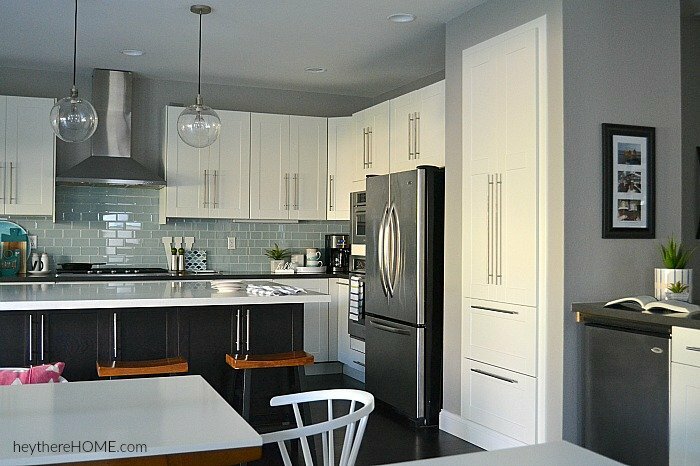 I just love how this new addition to our kitchen adds to the finished look of this space we created! 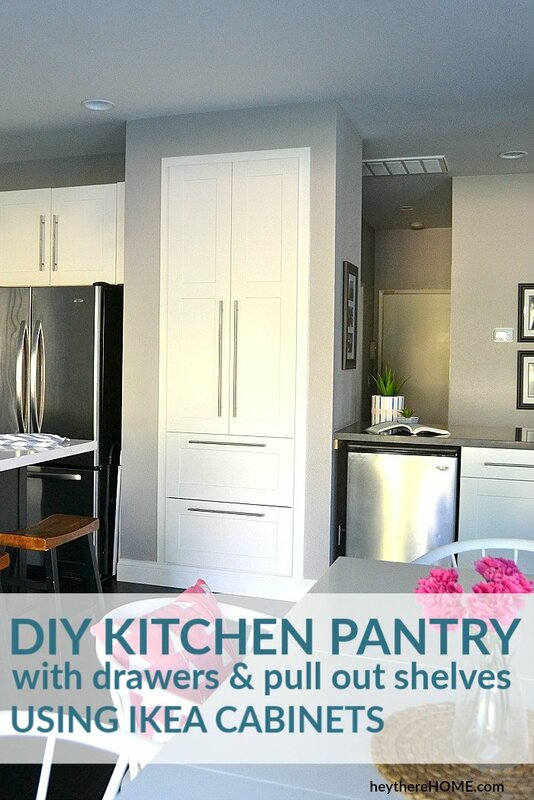 If you have a closet pantry that doesn’t fit your needs, definitely consider taking a project like this on. It will improve the way your home looks and feels. narrow hidden drawer inside the top bottom drawer: Maximera low drawer with Utrusta low drawer front. Genius! Thank you so much! Your advice, photos and details make me feel I can do this! It looks beautiful! Happy to help, Hafele! Thanks for stopping by! Excellent! Great job, Corey. I love it. Especially how you organized the drawers. Thanks, Laurie. Those pull out drawers really make organizing soooo much easier! Wow. I Love it. Looks amazing and it has so much storage. I have a perfect spot in my kitchen to do this. Fingers crossed one day it may happen 🙂 I was wondering though in the products list, you list the ikea cabinet but then you list all the drawers and shelves, are they not all included when you buy the entire cabinet? Did you buy different ones? Sorry im a little confused. Thank you. Great question Stacy. The main cabinet I have listed comes with the two lower drawers, two medium inside drawers in the upper portion, and two shelves. We added the other two drawers listed. 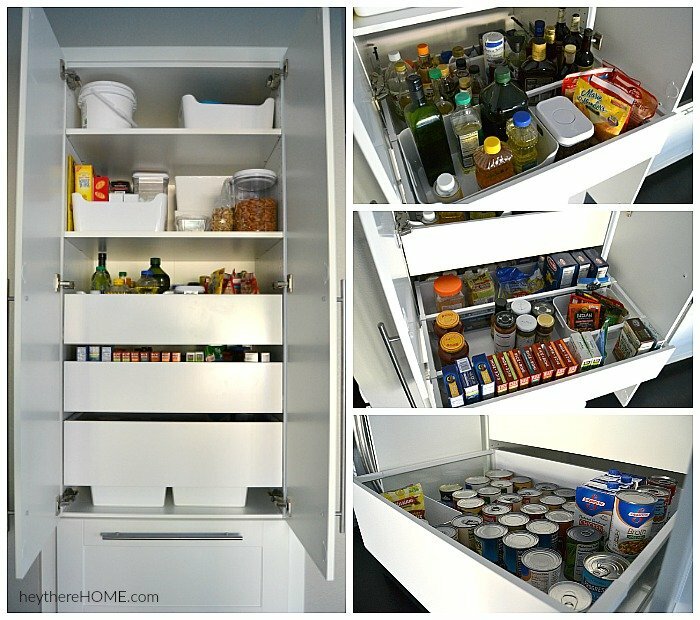 One low hidden drawer inside the top bottom drawer, and one high drawer for canned goods in the upper portion. The high drawer allows me to stack 2 cans without them falling over. Thanks Lauren and have fun with that laundry room project! It turned out so good! I am totally jealous of those pull out drawers!